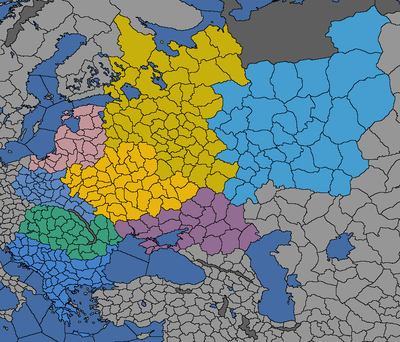 The regional divisions of the Eastern Europe super-region. The Eastern European regions are all part of the Eastern Europe super-region. The southern regions serve as the main theater of conflict between the Ottomans and the European nations. The central regions are the historical birthplace of the Commonwealth while the northeastern parts saw the rise of Russia. The area sees a change in the dominant religion the further away it gets from the main heartland; from Catholic in the central continent to Orthodox in the eastern parts and to Sunni around the Black Sea. Autocracy and Feudal Nobility are the dominant government types in these parts, with Russian Principality predominating in the eastern parts. A few Theocratic governments forms are located in the northern part (along those are the Monastic Orders). A few Republics are spread around (Plutocracy and Veche Republic). Steppe Nomads (and some Tribal form) governments start to appear around the Black Sea. Catholic still dominant in areas closer to the center of the continent. Sunni appears around the areas surrounding Black Sea. Orthodox is spread in the rest of area, at times as a buffer between the two above. Western in the northern and southwestern parts. Anatolian and Nomadic in the southern parts and around the Black Sea respectively. Eastern is spread in the rest of area. Germanic and a bit of Ugric in the most northern parts. West Slavic and Carpathian in the western parts. South Slavic and Baltic in the central parts. East Slavic and Tatar in the eastern parts and around the Black Sea. Byzantine (along with Latin) and Levantine in the southern parts. Notes: This region holds provinces necessary for forming Greece, Romania, Byzantium, Croatia and Roman Empire. The province of Constantinople (151) is of religious importance for Orthodox nations. Notes: This region holds provinces necessary for forming Kurland and Prussia. Notes: This region holds provinces necessary for forming Romania. Notes: This region holds provinces required to form Poland. Notes: This region holds provinces necessary for forming Ruthenia, Golden Horde and Mongol Empire. Notes: This region holds provinces necessary for forming Mongol Empire and Russia. Notes: This region holds provinces necessary for forming Mongol Empire and Ruthenia. This page was last edited on 14 December 2018, at 08:23.